You’ve likely heard the question or even asked it yourself. After answering “History” to the question of what I studied in college comes that dreaded second question. The question that comes nearly 90% of the time to history (and English, I’m sure) graduates. I don’t know why the question irks me so much. It’s innocent enough. Plus it seems like a large portion of history graduates do go into teaching. 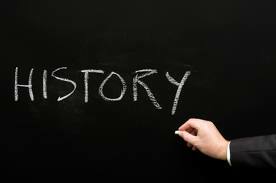 Maybe it’s the underlying assumption that history is only useful for teaching. It’s a ridiculous concept, really. If something is only good for teaching others, why bother learning it in the first place? I like to say that I study history for what is, not what was. I learned to think, to analyze, to communicate, to see what I’m seeing. I studied history to understand what ties humanity and the world together. I learned to recognize and make sense of differences in street layouts and housing design over the 20th century in America, and the subtle racism and classism in post-World War II suburbanization. I learned to recognize strains of political and religious thought in American culture. I learned to dig deeper than initial, simple stories and listen to unheard voices. I learned to look for connections—after all, a fact by itself means nothing (much credit to my advisor, James Bratt, for that one). I learned to pay attention, most of all, to recognize continuity and change as time goes by. The dreaded second question sells history–and the humanities in general–short. I’m a much better person for having studied history. I’m a better citizen, thinker, friend. I have little interest in teaching, but I’ll be forever grateful for studying history. Are those not good enough reasons to study history? I propose we begin asking better questions of history grads: So you like reading and writing? How does your degree shape how you see the world? How have you continued to learn about and analyze the world around you? What unheard stories are you listening to? So please, stop asking me if I want to teach. Do all history grads a favor and ask more than the dreaded second question. We thank you in advance. This post also appears on the post calvin, a blog for young Calvin alumni exploring the post-diploma years. Matt Beukema is a 2015 history graduate of Calvin College. This entry was posted in Alumni Voices, Student Voices and tagged alumni, Calvin College, education, history, humanities, post-grad. Bookmark the permalink. I do remember that you had mentioned your advisor in class. It’s good to know that this wisdom is getting passed on to multiple generations of Calvin students. It’s certainly shaped my way of thinking and looking at the world.